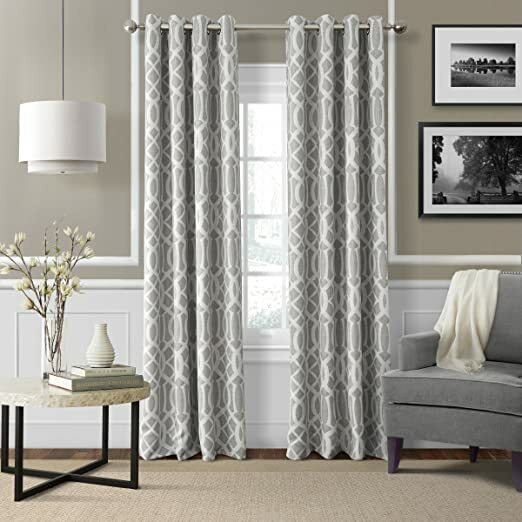 This curtain by Elrene Home Fashions is suprisingly soft. The "gray" is a brown-based grey, not a silvery-based Gray. This soft, muted gray looks great with my oak, metal and dark gray bedroom suits. It even looked nice in my granddaughter's light pink bedroom. So, I think it's safe to say the color and design can work with almost any paint scheme, theme or choice of furnishings. The stitching is tight, continual and even. I found NO loose, missed, irregular or hanging threads. The measurements are point-on at 52"x84". The grommet openings will accommodate curtain rods up to 1.5"
The most important aspect for me when purchasing curtains described as "blackout," is 'just how blacked out are they?' Well, I would NOT describe these as blackout. Room darkening? Yes! But, honestly no more so than any other well sewn curtain with a backing. This panel is light-weight with a solid white backing. It blocks light like closing any curtain. To achieve the level of darkness most prefer in a bedroom, you would need solid closing blinds under the curtain. Customers make note - Despite the product page picturing an actual "set" (two panels), this package contains ONLY ONE PANEL. This is a nice curtain. The color and design look good with many different decorating styles. I think it's a lil' pricey for just ONE panel, considering it is NOT a true blackout curtain. I have no problem recommending this as a curtain to anyone. BUT if you're looking for a true blackout, I strongly recommend a different selection.